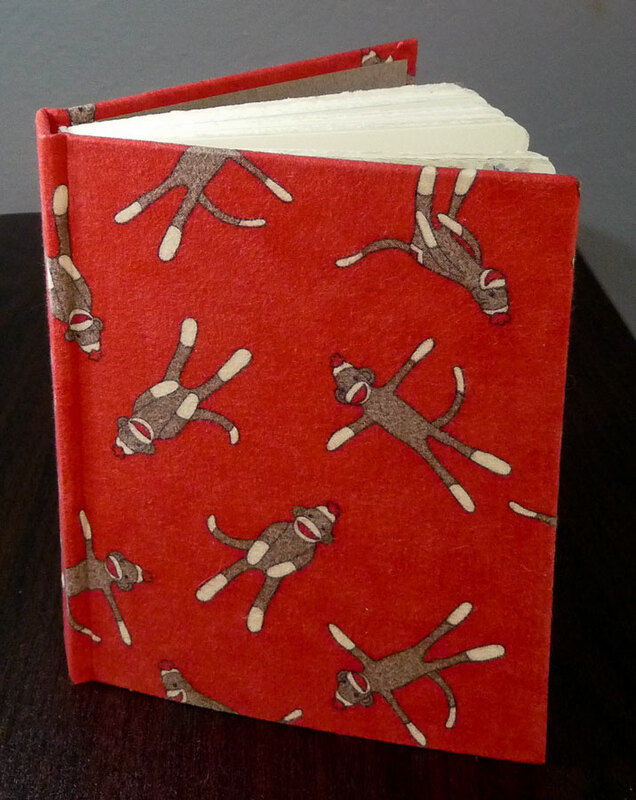 Monkey Business Journal, covered in flannel, 8x6"
When I was a kid I had a sock puppet that looked like this so when I saw this fabric at the store I couldn’t resist. I used a piece of it to cover a cushion on a stool about 5 years ago and then put the rest on the shelf. 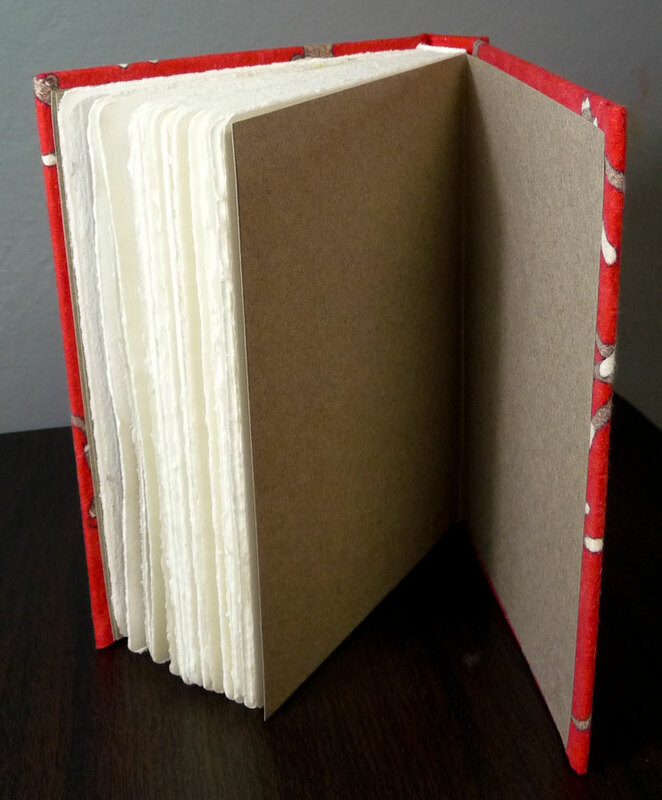 I needed to bind a new journal right away and was too lazy to go shopping for book cloth or to make my own. Hence off the shelf and onto the book! For the end papers I used some lovely warm grey paper a friend left at my house from a family history book-making project I was helping her with. 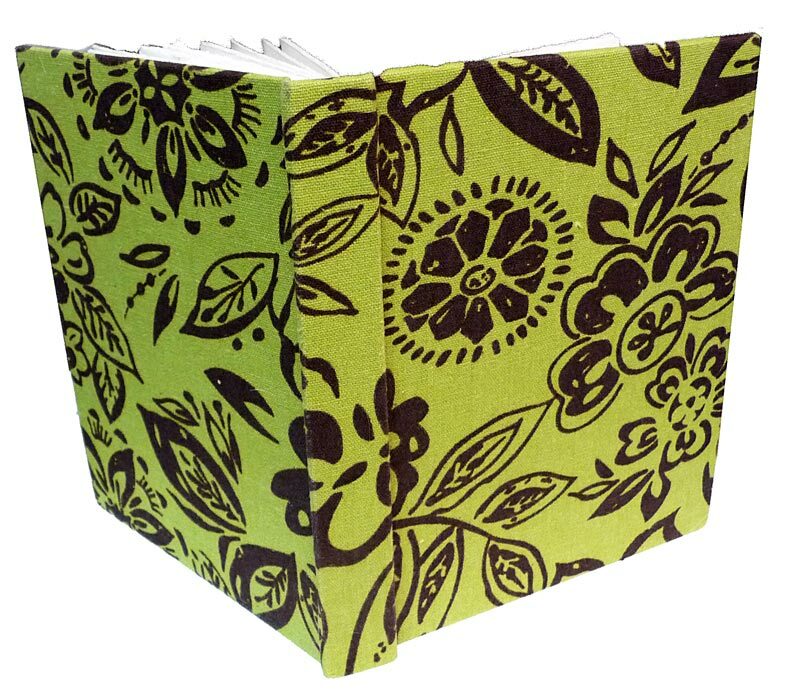 This was the first time I could use my case-bound journal making instructions all the way through without needing to revise them and it went really quickly. I’ve actually been using this journal already for a couple of weeks and writing this post prompted me to name the journal which I hadn’t yet done. Calling it “Monkey Business” will help me to lighten up as I use it, to get more playful and fool around and let go of “right” and “good” which always trip me up when I get in that judgmental place when I’m drawing, instead of just enjoying the act of looking and sketching what I see. And since it’s red flannel it’s warm and cozy–perfect for fall sketching. 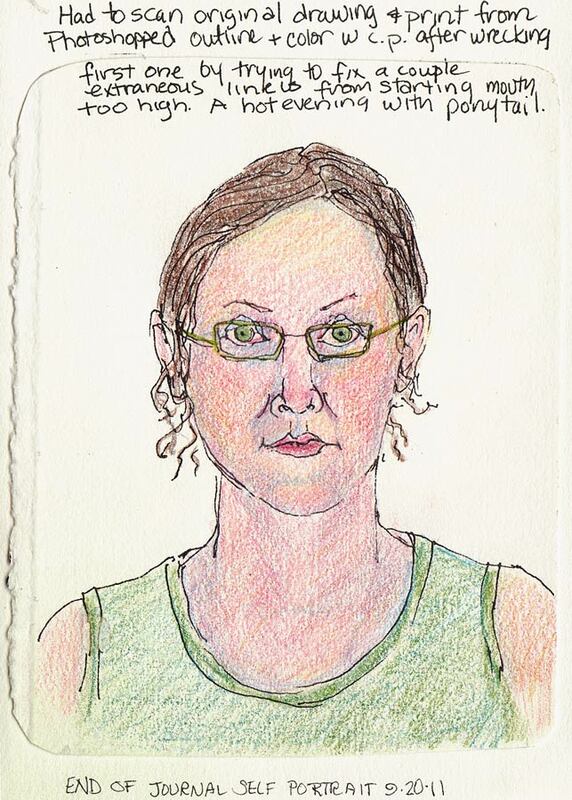 End of Journal Self Portrait, colored pencils, 7x5"
As I complete each journal I draw a self-portrait for the last page. I really liked the ink drawing I made for this one but then totally messed it up when I was painting it and tried to “fix” something. The more I tried, the worse it became. So I scanned the sketch and used Photoshop to remove all the color, leaving me with just the original line drawing below. 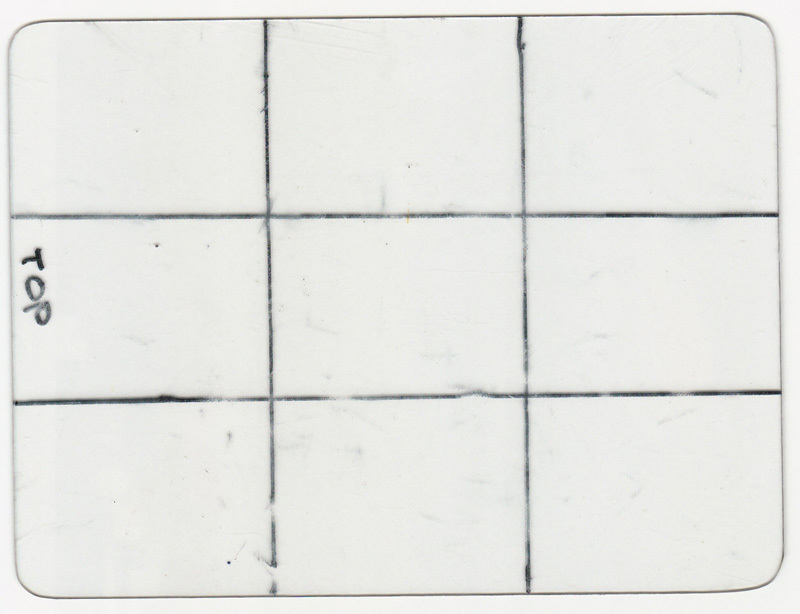 From Photoshop I printed the line drawing onto a piece of the same watercolor paper I use in my journals. Since the ink from my inkjet printer is water-soluble (darn) I couldn’t add watercolor. I used Faber-Castell POLYCHROMOS colored pencils instead and tried to keep a light touch after having overworked the original. I cut out the sketch to fit into the journal (and cover the yucky sketch), and glued it down with a glue stick. 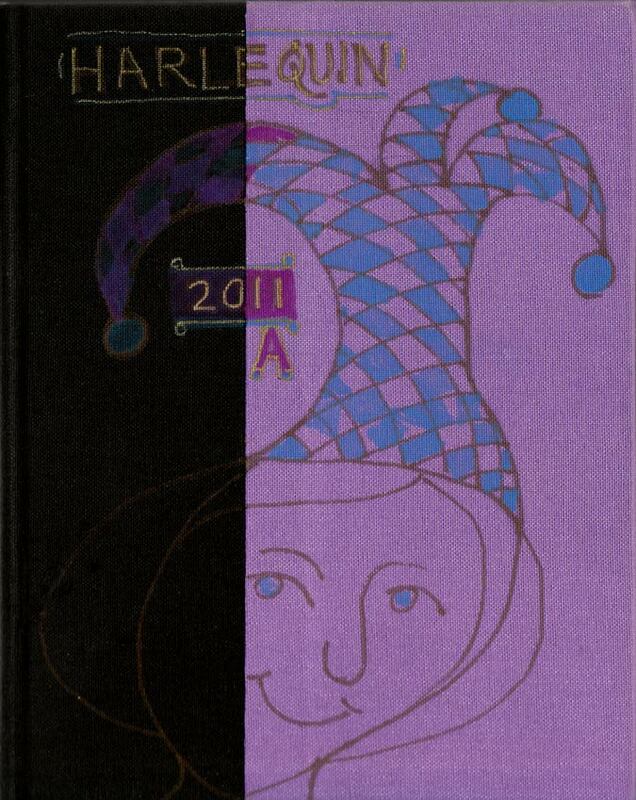 The completed journal is pictured below, covered with a piece of an old tablecloth that lost its “oil cloth” coating when I washed it years ago. It’s so interesting to me how these end of journal sketches turn out. I’d had a rare and unusually good night’s sleep and was in a good mood when I drew this one. 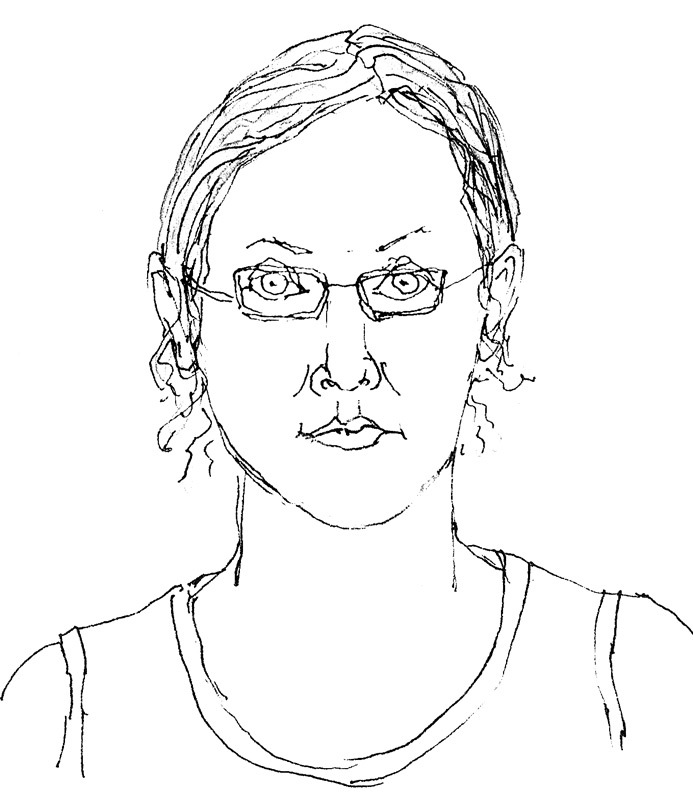 What they say about beauty sleep seems to be true, even in sketches — I definitely look more youthful and pretty in this sketch than some of the others I did under less optimal circumstances. 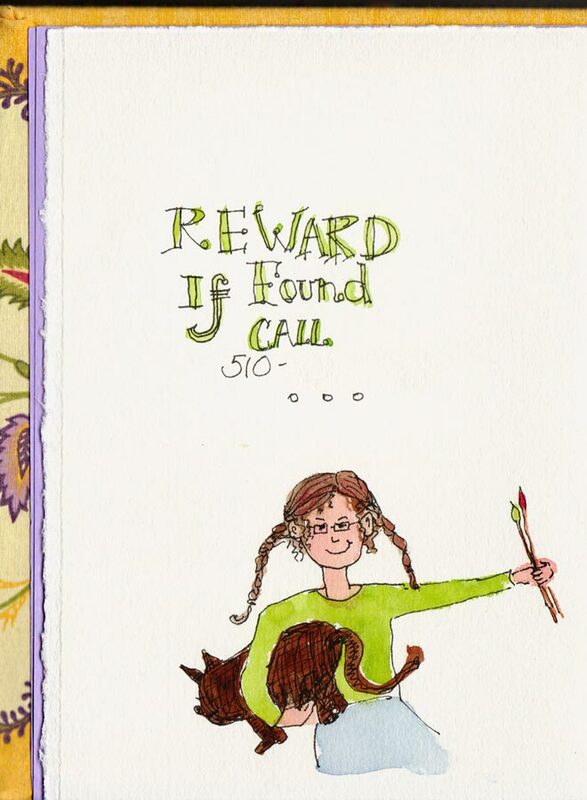 You can see previous end of journal self portraits at this link. 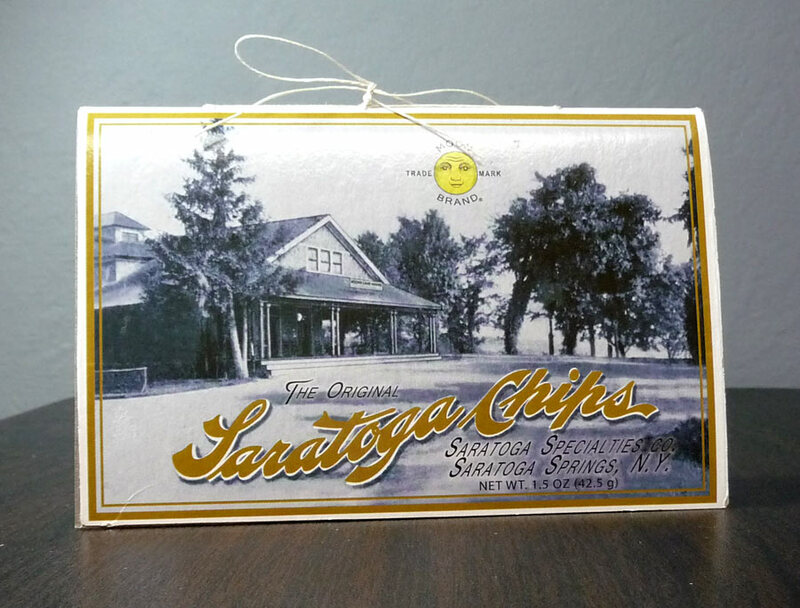 Foil bag of potato chips reflecting on red cloth, ink & watercolor, 5x7"
When my friend Mindy sent me a fun little gift box of potato chips (which were invented in her town, Saratoga Springs, in 1853–read funny history here), I was smitten by the cute box (photo below). 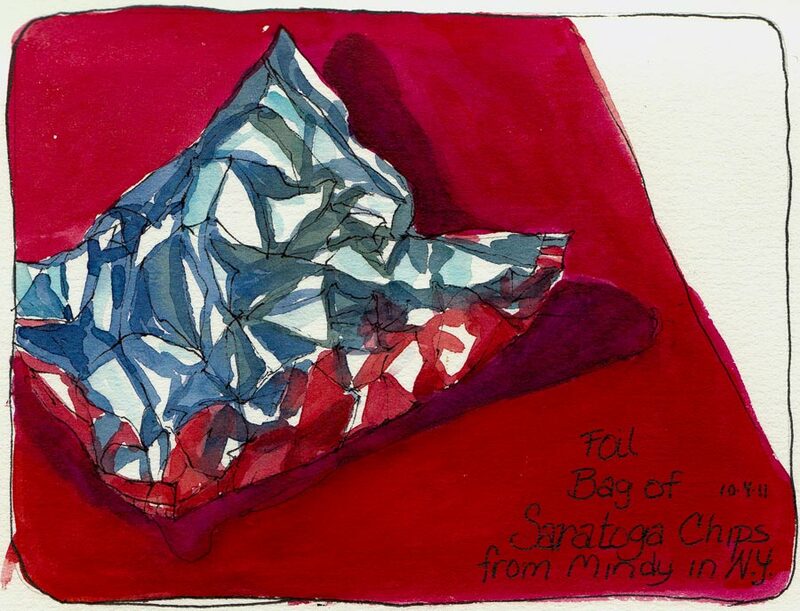 Then I opened the box, saw the foil inner pouch and had to try to draw it (sketch above, on a red cloth). 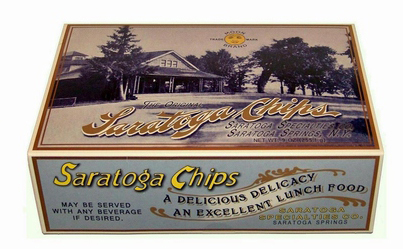 The box was charming, a replica of their original packaging from 1853. 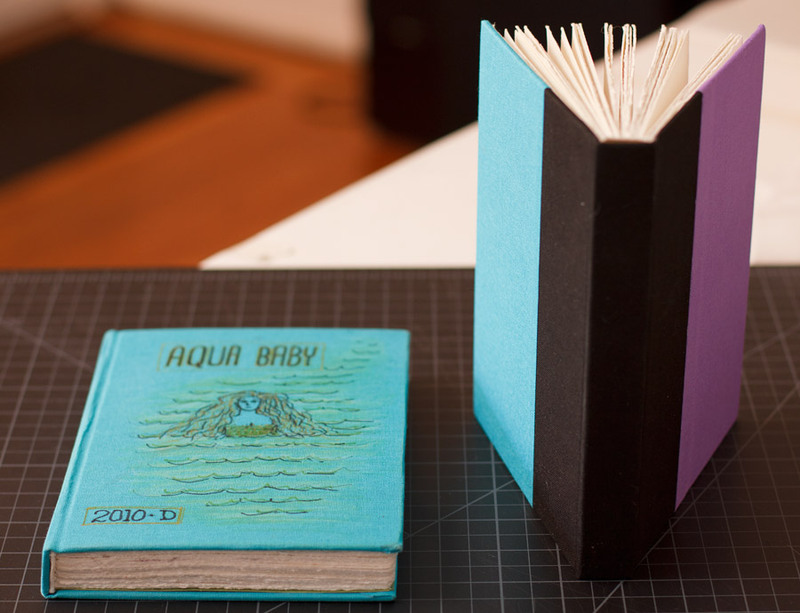 I remembered seeing journals created from packaging on the fabulous Make a Book a Day blog where Donna Meyer binds and posts a new book almost every day. In August she did a whole series of recycled packaging books, from KitKats and Snowballs to root beer books. Birthday Flowers Self Portrait, ink & watercolor, 7x5"
To put the finishing touches on a completed journal, I make a self-portrait for the last page. Since it was also my birthday, I wanted to incorporate my birthday flowers in the painting. 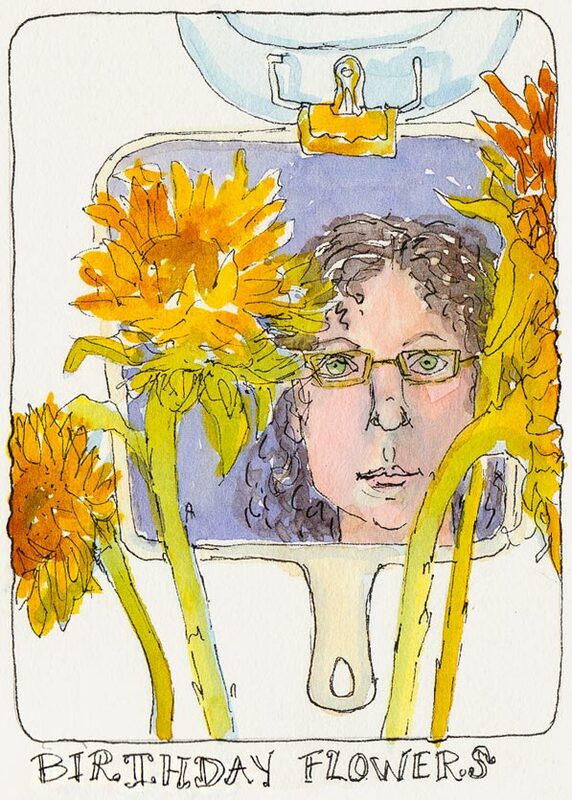 So I hung a mirror with a yellow clip from one of my swing-arm lamps on my drawing table and put the vase of sunflowers between me and the mirror and then drew what I could see in front of me: the flowers in front of the mirror, with me and the flowers reflected in the mirror. As usual for my end-of-journal self-portraits, I wasn’t willing to measure or try to draw and place features accurately but I think I did capture the feeling of me or the me as I was feeling. 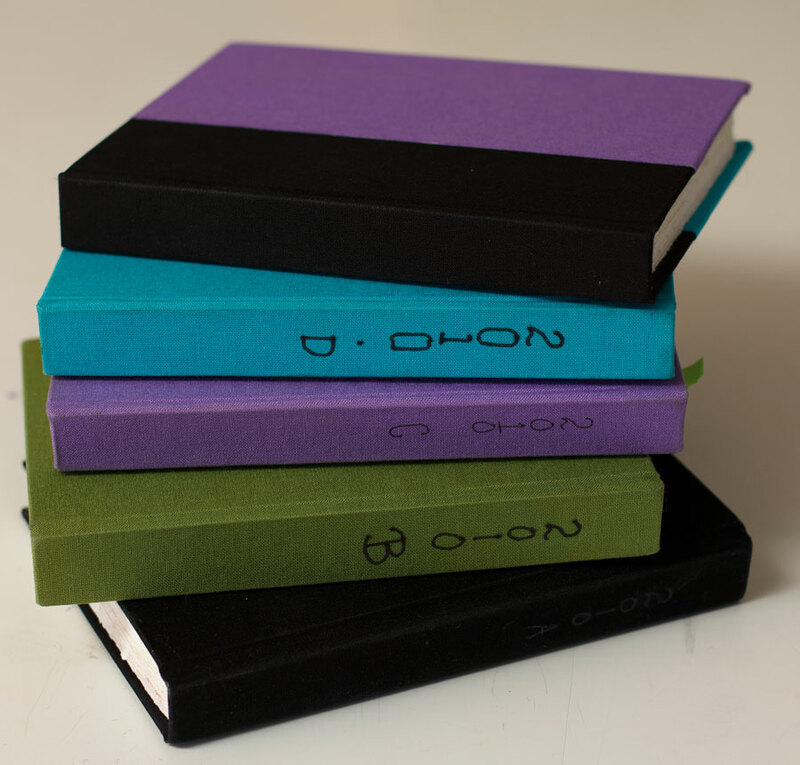 In the next post I’ll show you my new journal and another idea I tried out for sketchbooking minus the sketchbook. 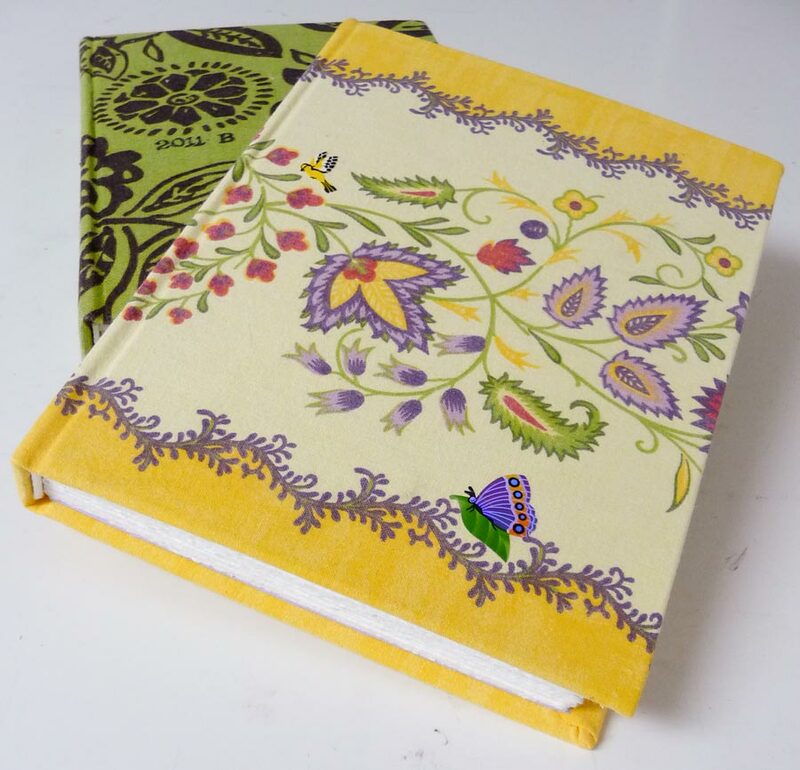 Yesterday I bound a new journal and updated my instruction sheet on how to bind a 5.5″ x 7.5″ sewn-signature casebound journal with watercolor paper. Each time I bind a journal I learn a little more and update my how-to sheet as I work so that the next time it will get easier for me. I created the instruction sheet as a guide for myself, compiled from many sources* but you are welcome to download the file if you’d like to make a journal like these. I keep it on my website’s Resources page here on JanaBouc.com because having it in one place makes it easier to find and update. I name each journal (actually they seem to name themselves as I’m binding them) and decorate the cover after I’ve filled it with an image fitting the name. 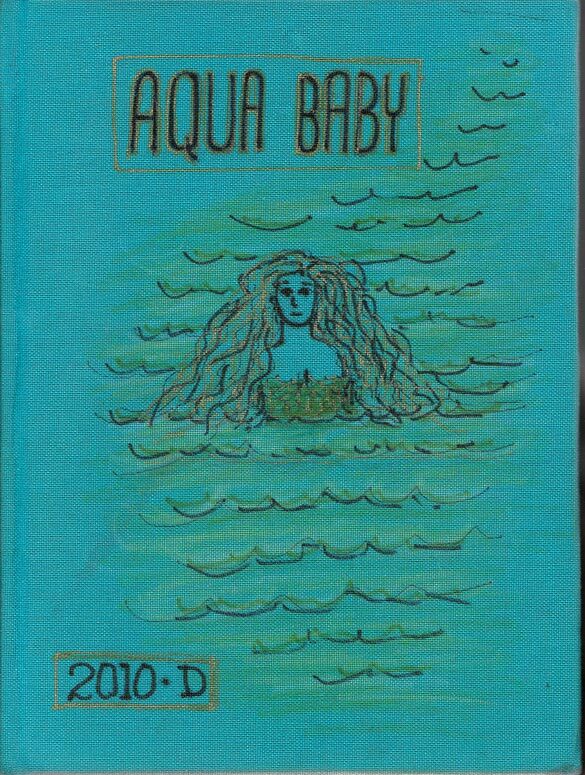 My last journal named itself “Aqua Baby” and is pictured above. 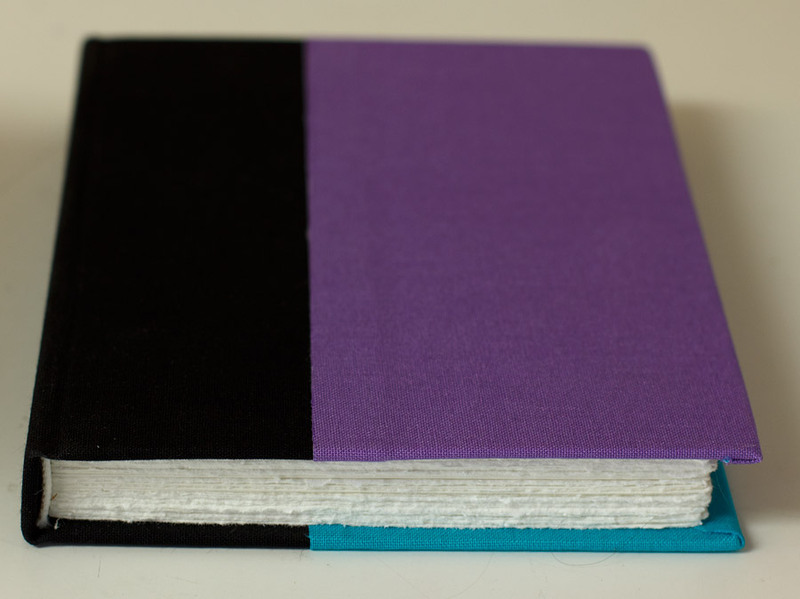 I wanted to try (for the first time) to bind a cover made from pieces of book cloth, one for the spine and two for the fore edges. I thought I had a big enough scrap of the purple but mis-measured (as usual). So I had to use some of the turquoise cloth to cover the other side. This journal has named itself “Scrappy” as it’s covered with scraps and was scrappy enough to demand to get made despite everything working against that right now. 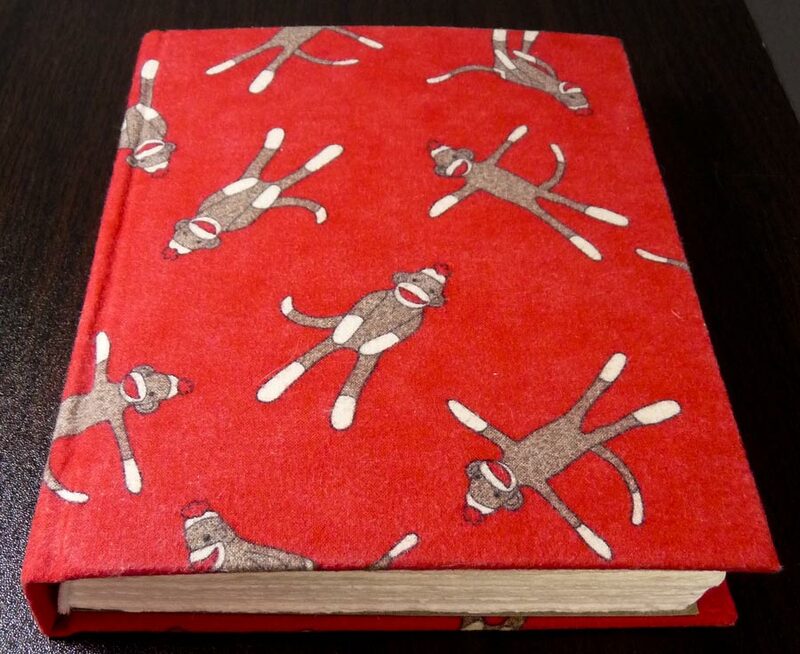 Although I’ve bound other journals using a variety of methods, here are the five sewn-signature case-bound journals I’ve made and here’s another look at their covers. I love the paper, the dimensions, the feel in my hand, the way they’re easy to use sketching standing and for scanning. They are humble and a little plain, but I’ve always appreciate function more than fancy. 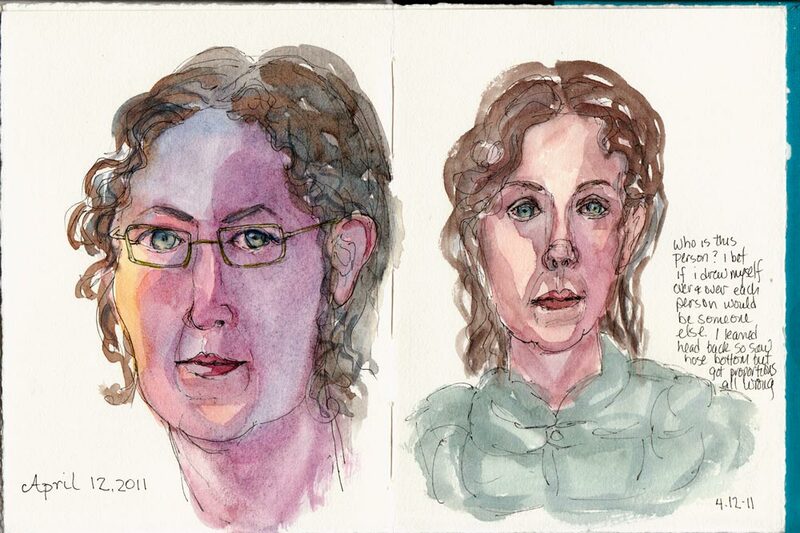 I can’t wait to finish the hated Moleskine watercolor sketchbook (which would be fine if it was just portrait, not landscape) that I’ve used since I got behind on binding. Watch for a flurry of sketching to finish it off!